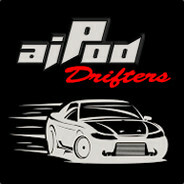 This is the drift group "aiPod"
We are regulars on "Driftjunkies" severs in Assetto Corsa. This group was originally formed so that people know that we drift together and are friends, this still stands! However because when this group was formed, it was solely comprised of skilled drifters and we wish to maintain this standard for this team (which is the barrier of entry into this group). We mostly drift with each other and try to teach new members new and different lines on the drift map, learning how to lead and tandem also. Sometimes we may be on my discord using vc (voice chat) to shot call different lines to do in unison, or complex lines where both drifters are doing different lines at the same time, sometimes involving overtaking. If you would like to join this group, speak to either me (aiPod.Junior) or my main drift partner (aiPod.Senpai). To join, we will need to observe how you drift on the drift map in driftjunkies and from this (including analysing your attitude towards others/maturity etc) we will come to a decision to either give you an invite to join or a rejection followed by a reason.